Competition fishing demands solid and dependable boats, capable of getting there and back whatever you throw in their way. As Terry WilliamsKing finds, the Stabi 2050 Fisher doesn’t disappoint. With two Stabicraft 2050 Fishers handpicked for 20-plus ego-filled anglers competing in series three of the televised Export Gold Match Fishing League, getting out there and back was never going to be in question. But just how well do these iconic workhorses cope with the demands of serious competition fishing? The Stabi 2050 Fisher is one of five models in the popular Fisher range. 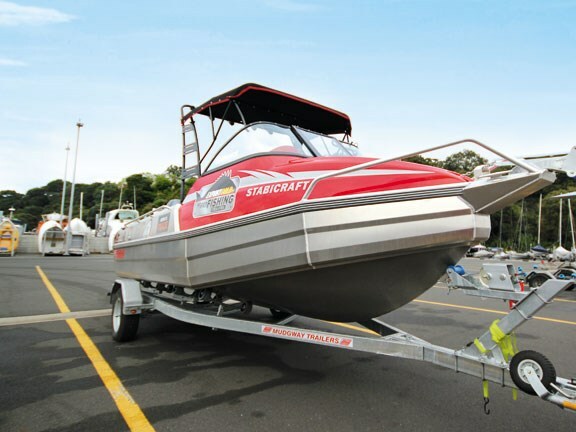 Like its stablemates it certainly turns heads sitting on its trailer on the on the hard, but on the water it’s all about performance and fisher usability. Let’s be frank: these are no-frills fishing boats designed to provide a safe and spacious fishing platform, with the sort of handling and stability serious fishos demand. Television production schedules are tight and pay little heed to Mother Nature. The 2050 hull features Stabi's award-winning pontoon design that deliver a stable platform at rest – at key criteria for serious hour-on-hour angling. They’re not the prettiest hull on the eye but they are effective and safe, with six sealed compartments that extend from bow to transom and provide a life ring for all on board. The hull is constructed from 5mm marine alloy plate and the tubes are fabricated from 3mm plate. The 2050's length runs out at 6.27m, with an outside beam of 2.31m and inside beam of 1.62m, which all adds up to a large workable cockpit and a cabin positioned well forward. This gives anglers room to move around the cockpit without having to climb over each other when the action heats up. The 2050 has a handy grabrail that runs the exterior length of the boat, from the rear edge of the cabin through to the transom, and one thing I never tire of is something solid to hold onto. This rail has a myriad of practical fishing uses to boot - tying off drogues, burley pots and fenders, to name but a few. The cabin has a very tidy fibreglass top that seamlessly meets the alloy hull and undoubtedly adds to the 2050's aesthetic and purposeful look. From the outside you'd never guess that the 2050 is a hybrid, utilising the particular strengths and qualities of aluminium and GRP. Step aboard and the 2050 holds instant appeal for anyone with fishing on their mind. Cockpit space is outstanding and the soft-top cabin serves up reasonable shelter whether it's harsh summer sun or breaking waves rolling over the bow. Being removable, the rocket launcher conveniently folds down for garage storage at home. Moving forward into the cabin, it's pretty austere with nothing by way of cushions, but it is certainly practical with a single rail shaped in a horse shoe for containing the day's gear whether its tackle bags, dive bottles, safety bags or an extra chilly bin. The split windscreen with outward-opening window is a practical feature of the 2050 and provides easy access to the forward hatch and bow rail. A small step adds a bit of working height without compromising stability, while attending to work out in front. This Fisher model has a well recessed capstan and there's no real need for crew to venture forward unless you've fouled an anchor or tossed out a manual grapnel. Frankly, the foredeck is really only suitable for the agile. Basic but practical, the skipper's pedestal provides a comfortable helm station with basic seat adjustment, footrest and plenty of room for the 'sized man' when standing. Flush-mounted electronics are easily accessible and viewable with no shortage of fascia to accommodate even quite large instruments. These particular boats were fitted with a Lowrance HSD7 combo unit, which was fine but I would have preferred a larger 10" unit for better visibility when fishing at the rear of cockpit. There's plenty for the passenger to hold on to as well, with grab rails on the seat and on the side and forward edge of the windscreen - a must if you're at the mercy of a speed-happy skipper. 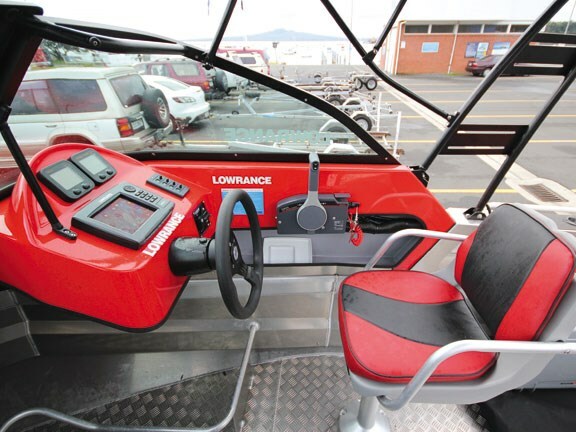 The cockpit, however, is where it's really at, with large side pockets capable of gobbling up the full range of a fishing gear and several 7m-plus rods as well. A large Iceytek fish bin mounts easily in the centre creating an extra seat and there's a well-positioned slurry box. In this instance, it was mechanically fastened to the deck but it's easily removed at the end of day for cleaning and preparing the catch. A live bait tank is situated aft on the port side near the boarding ladder and narrow transom walk-thru. The tank is filled with an accessible pipe tapped into the tank that acts as a venturi when the boat is at speed. The glass front is a nice touch, but the outlet could possibly be a fraction bigger. 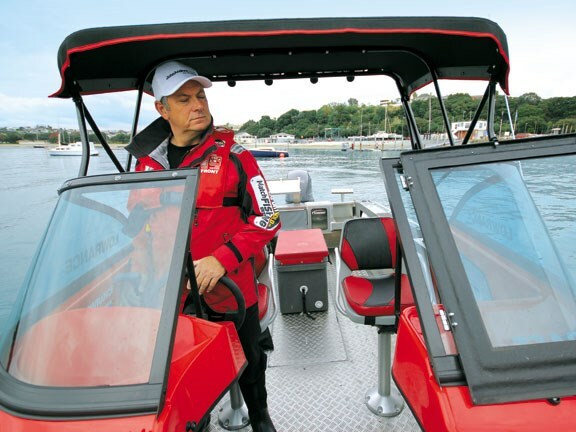 With safety paramount, Stabi has added a grille plate across the rear of the cockpit under the transom, to prevent the bilge pump from becoming blocked by debris. A curtain on the starboard side of the inboard transom protects the boat's twin batteries. These are easily accessed along with the battery switch. Paralleled crank and house batteries are a must in my book for boats of this size, especially with the tendency these days to fit out our boats with a vast range of power-hungry marine electronics. Four rod holders are set into the gunnels, two each side. In my opinion these are a little lightly built and a bit short on numbers, but this is easily fixed when ordering, especially if you're serious about some offshore action. A heavy duty bait board is fitted slightly starboard of amidships and provides three rod holders, knife storage and a cutting board. Its position is well considered, giving anglers plenty of swinging room when fishing out of the favoured aft cockpit corners. Removal is also an option. 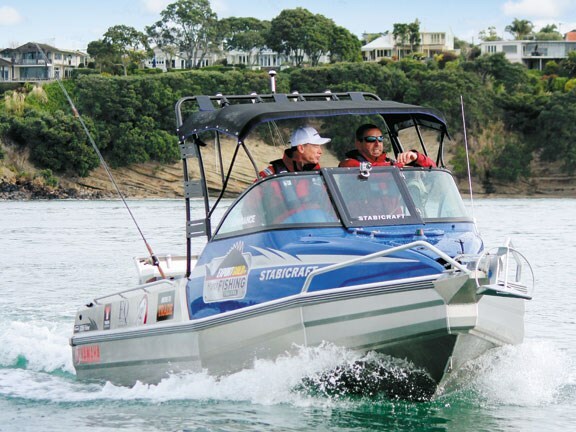 On the water, these trouble-makers are powered by identical Yamaha 115hp four-stroke outboards. I must admit being very sceptical about their ability to perform with three anglers and enough tackle to fill a tackle shop, not to mention a camera operator, his gear and a presenter: I thought we were under-powered and that the recommended maximum 150hp might have been a better option. How wrong I was. The boats were responsive and got up and boogied. At 4700rpm they cruised along at 31 knots and at full tilt bolted to a very healthy 38 knots. Trimmed right up at 4300rpm, the 2050s romped along at a comfortable 27 knots. The hulls are responsive across a range of speeds and very capable of turning tightly, without any apparent effect on stability and very little cavitation. 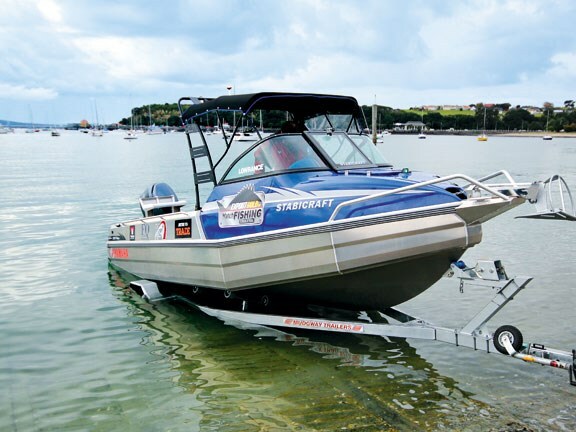 Unlike many hard-top trailer boats, the small canopy is unaffected by the wind, making handling responsive in and around wharves when fishing the extreme shallows. All up, the 2050 is a delightful and willing performer with no obvious vices. Conditions for the photo shoot were disappointingly calm, which went some way to explaining the large number of small boats on the water for a week day. However, a recent match held in the winterless north using the same rigs was a very different story. Both boats ventured out to the Hen and Chicken Islands from Whangarei Harbour and were met by a 15-20 knot southwester throwing up messy metre-plus seas. That was uncomfortable, but the trip home was just plain nasty, with the forecast 30-35 knot southwesterly arriving early, with wind against tide. The long slog back was ugly. The sea was full of holes that tested the boats every which way. Miserable as it was, the 2050s stuck to their work, got us home safely and without incident or any cause for serious concern. These are tough, capable, boats that live up to their Fisher branding. I wouldn't hesitate recommending that any serious angler looking for a boat put the Stabi 2050 somewhere near the top of his short list for testing and evaluation. The 2050 is a great yard stick by which to measure other contenders in its class. This is not the ideal family boat and it doesn't pretend to be - but it is certainly a boat your fishing mates will love you for.